A high school student is fighting back after her senior photo was pulled from the school yearbook. 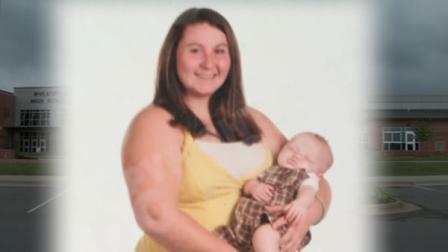 The photo shows North Carolina senior Caitlin Tiller holding her now one-year old son. The school asked students to have their picture taken with something that best represents them or an achievement. Tiller chose her son because he represented her drive to stay in school. The school didn't see it that way. Caitlin says she was told the picture promoted teen pregnancy. She sees it as a symbol of responsibility and love. "They should be proud that the students are willing to stay in school and graduate and make something of their self and not try and hide it," Tiller said. School officials would only say the yearbook should be all about the student and not an extension of the student's family. As we've said before, preventing abortion means preventing unplanned pregnancies and supporting mothers. This includes teen mothers. Of course pregnancy and parenthood represent serious challenges for a teenager, and reducing teen pregnancy rates (read: unplanned pregnancy rates) is important. But once a teenager is already pregnant--or already a parent--she should be supported, as all parents should be supported. Society's message to our youth should be: "Here are the serious responsibilities involved in pregnancy and parenthood. Here are the ways you can avoid pregnancy [abstinence, various birth control methods]. But if you do get pregnant, you will still be okay. You are not alone." Tiller's attitude about being a teen mom is admirable, and we salute her. I think when it comes to raising children, many parents express disapproval when their children do something the parents have taught them--or are trying to teach them--is "wrong". So, the disapproval carries over even into teen pregnancy, even to society at large. However, as parents, we need to think this through to scenarios such as this and make a decision to by supportive for life & the courage it takes to choose life. Random thoughts: I wonder if there is any research into teens' response to support for the teen parent versus stigmatizing teen parenthood. That is to say, do teens equate support of the teen parent as a green light for teen sexual activity & teen pregnancy? Does stigmatizing teen pregnancy have any impact on their choice to become sexually active? And what about the overwhelming media (magazines, movies, internet) impact on the teen mind and resulting sexual behavior? Great point on your Random Thought. Where is the data saying that supporting a teen mom is going to make teen pregnancy popular all of a sudden? Maybe it exists, maybe it doesn't, but we should have it before sweeping statements like the school is making are allowed. I remember going through high school and there were a maybe 2-3 teen moms (in class of 140). At no point did I ever feel this made me want to become a mom. But that is just an anecdote.